We as humans make thousands of decisions each day, but many of these may be habits or choices that are not the most environmentally-friendly. How can we effectively change our behaviours to reduce waste, increase resource efficiency and strengthen policies for sustainable consumption? These are some of the questions tackled in a new UN Environment report, 'Consuming Differently, Consuming Sustainably: Behavioural Insights for Policymaking' - launched through this webinar. The GGKP, UN Environment (10 YFP on Sustainable Consumption and Production) and ideas42 brought together eminent experts to explore and debate the findings of the report and the topic of Behavioural Insights for Sustainable Consumption and Green Growth. 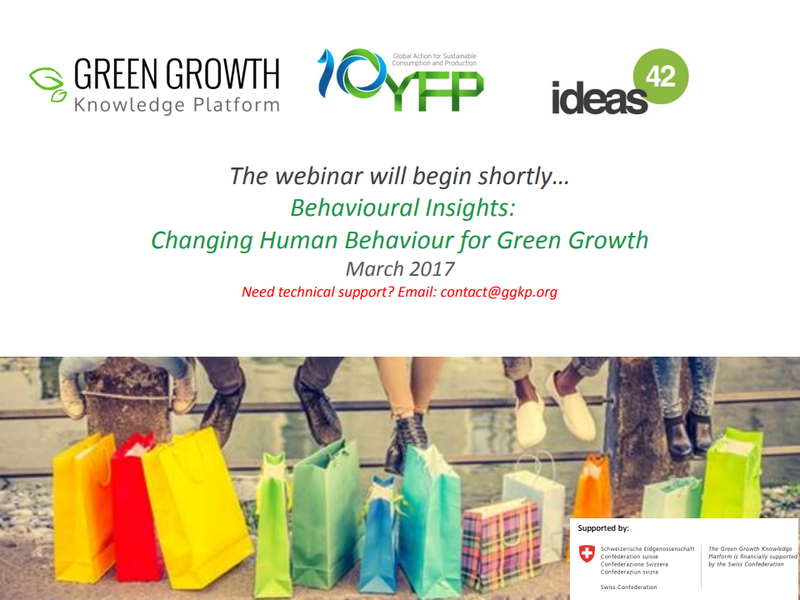 On 8 March 2017 (3:00 PM CEST), the GGKP held a webinar exploring evidence-based research on how behavioural science can further resource efficiency and sustainable consumption.